James Franklin and Nick Marshall face off in Atlanta for the SEC championship. After a season full of upsets and unforeseen turns, we’ve finally reached conference championship week. Will Ohio State get by Michigan State and keep its BCS championship hopes alive? Can Todd Graham keep his Arizona State Sun Devils rolling to the Rose Bowl with a win over Stanford? We’ll tackle those, but let’s start in Atlanta, where Missouri will have something to say in the SEC. Check out CollegeFootballNews.com for more on this week’s games. Why You Should Give A Hoot: You’ll have to forgive Auburn if it starts to believe in that whole “Team of Destiny” thing. After two of the wildest endings in college football history — the Hail Mary to beat Georgia and the improbable kick return for a score against Alabama — getting by Missouri might seem like nothing more than a mere formality on the way to the BCS championship. Of course Ohio State is going to lose to Michigan State, Duke will pull off the upset of all upsets against Florida State, and Auburn is going to find a way to get by Missouri. Everything seems to work out for this team. However, you’ll have to forgive Mizzou if it doesn’t buy in. The Tigers of Columbia had one really bad quarter, eventually leading to a loss to South Carolina in double OT. Outside of that, this has been a dream season for a program that fell flat on its face last year, going 5-7 as some mocked the idea that a Big 12 school was capable of holding up under the physical pressure of playing in the SEC. But after the way things have played out this season, Missouri has a little bit of destiny on its side, too. Auburn might have been on the right end of a few miracles, but Missouri has put itself in a position time and again as to not rely on such memorable finishes. Last week’s 28-21 win was the Tigers’ closest victory all season, and while beating banged up Georgia and Florida teams might not seem impressive, Missouri is coming off its best win all year against the Aggies. Overall, this has been a totally surprising campaign from Mizzou. The Tigers have been in this spot before under head coach Gary Pinkel when the team was ranked No. 1 in the nation six years ago with an 11-1 record before losing to Oklahoma in the Big 12 title game. That team had the national championship in reach and lost it, but this year’s Tigers could finish the job with a win over Auburn and a little help from Michigan State. Yes, if Mizzou wins, it — not Alabama — will play in the BCS championship if Florida State or Ohio State fall. No, a one-loss SEC champion wouldn’t leapfrog a 13-0 Buckeye team in the final BCS standings. At the absolute worst, the winner in Atlanta will be the SEC champion with a ticket to the Sugar Bowl. Arlington isn’t Pasadena, but winning the SEC is still impressive, especially for a newcomer like Missouri. Why Missouri Might Win: The defensive linemen can collapse from the outside and pinch Auburn’s run game. Texas A&M QB Johnny Manziel was banged up and didn’t appear to be his normal self, but there’s a reason he was held to just 21 rushing yards on 11 carries and threw for a season-low 195 yards and one touchdown (if you don’t count the half game he played against Rice). The Tigers were able to generate pressure from the outside with Michael Sam and Kona Ealy being disruptive and forcing Manziel to hurry. Auburn QB Nick Marshall can make things happen up the middle, but the Auburn offense is at its most dangerous when he’s able to work the edges. Alabama doesn’t have much of a pass rush, and it showed. Missouri leads the SEC and is ninth in the nation in tackles for loss. In addition, Missouri has to be calm and can’t give up a slew of mistakes. Auburn doesn’t turn the ball over, but Missouri is fantastic at keeping the giveaways to an absolute minimum, too, with just 12 on the year. This week, they need to protect the ball the same way; Missouri can’t afford to give Auburn easy chances and short fields. Why Auburn Might Win: The Tigers must force Missouri to stall. Andrew Baggett isn’t a bad placekicker, but he’s a bit erratic hitting just 14-of-21 kicks on the year and whiffing on three of his last seven. He has a good leg, but he was hot earlier, and after problems against South Carolina, placekicking has been an issue. Ask Alabama what it’s like to have issues hitting field goals against Auburn. Offensively, Auburn can’t be afraid to unleash the passing game. Head coach Gus Malzahn has been terrific at adapting and adjusting game by game, and he has to get Marshall pushing the ball downfield — but carefully. Mizzou’s ball-hawking defensive backs are outstanding at taking the ball away, but they’ll give up the big play and they can be dinked and dunked on. The MU defense was great at bottling up Mike Evans and Texas A&M last week, but overall the pass defense is dead last in the SEC, giving up 266 yards per game. What Will Happen: Missouri is a bad, bad matchup for Auburn. Auburn’s pass defense is the second-worst in the conference, and that’s going to be a problem. MU has the right defensive front to keep Marshall under wraps and make him more of a pocket passer, and they have a big group of dangerous veteran receivers for Franklin to use and spread the offense around. 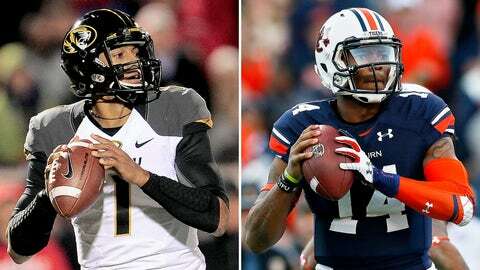 After last week, all the pressure is on Auburn while little of the focus has gone to Mizzou. The former Big 12 Tigers are going to be looser, and it’s going to make a big difference. Why You Should Give A Hoot: The Big Ten is taking a beating, and now the two teams in the conference championship are about to deliver one to each other. Think about it. This is Ohio State — the Ohio State. This is the team ranked No. 2 in the country in the preseason, the one that got through another season unbeaten, the Buckeyes that did everything it was supposed to do, that is coached by one of the best in the game, the team that could end up as one of just two unbeaten BCS conference teams in America. The Michigan Wolverines might have played out of their minds in an emotional rivalry game, but the Buckeye defense came through when it absolutely had to. Still, it’s hard to sell to America that this is a championship-caliber team after it struggled so much against a mediocre opponent. However, Michigan State is top ten good, and a win in the Big Ten championship should be enough to punch a ticket for the second Pasadena game no matter what happens between Missouri and Auburn. Michigan State will get the nod for Game One at the Rose Bowl as long as it doesn’t get absolutely obliterated. And if the Spartans win, they’ll go as the Big Ten champion for the first time since the 1988 game. Even if they lose, they’ll still almost certainly receive an at-large bid to face the Pac-12 champion. The Spartans have made a living this year off a suffocating defense, and while the offense has improved enough to become sufficient, they’re here primarily because of their stellar play against other teams’ attacks. Facing a pounding Ohio State running game, the MSU D will face, by far, its biggest test of the season. There’s going to be nothing frilly or pretty about this one. This will be an old school Big Ten, slug-and-run football matchup between two tough teams, and it should be tremendously entertaining. This is the chance for MSU to prove that it’s worthy of being included among the elite teams. It’s also an opportunity for Mark Dantonio’s program to finally take that next big step forward. Playing in the Big Ten title game for the second time in three seasons after losing to Wisconsin in a classic two years ago, the Spartans will try to make this one count. To get the job done, though, they’ll have to hand Urban Meyer his first loss as the Buckeyes’ head coach and change around the entire BCS national title chase in the process. Why Michigan State Might Win: If its defense is the real deal, it can contain the Buckeyes. Yeah, the stats are great, but it’s not like the Spartans have faced a who’s who of next level offenses. In fact they’ve given up 28 points to both Indiana and Nebraska. Ohio State isn’t going to change its style; it will try to shove around the bully by slugging the Spartans in the mouth. Michigan State has to hold on up front and has to turn Braxton Miller into a pocket passer. With a tremendous ability to pinch in from the outside, MSU should funnel everything up the middle into Riley Bullough. On the other side of the ball, Connor Cook has to hit on a few early passes. As Michigan’s Devin Gardner showed, the Ohio State secondary is mediocre and can be tested by a sharp passing day. Michigan State wants to run the ball and rely on its defense, but Cook has to stretch things out and keep Ryan Shazier and the OSU linebackers a wee bit off the line. If the passing attack doesn’t fly, the Spartans will have serious problems moving the ball. Why Ohio State Might Win: It doesn’t care about Michigan State and its reputation. The Buckeyes just run the offense the way they want. Ohio State likes to get Miller going early and mix things up with the passing game. Then they drop the hammer with Carlos Hyde running behind the support of a tough offensive line. The Buckeyes might want to try getting something going with the ground game right away, just to see if Michigan State can stop it. If MSU struggles, then Urban Meyer will call for plays that pound away on the Spartan defense. By the way, the Buckeyes’ defense isn’t too bad either. Ohio State is better at getting to the quarterback than MSU, and it will try to make Cook’s life uncomfortable from the start. It won’t be a huge deal if Jeremy Langford has a good day, but the Buckeyes can’t allow Cook the time to let downfield plays develop. The MSU receivers are playing better than they did last season, and they can make things happen if Cook finds multiple targets. What Will Happen: Michigan State, allow me to introduce you to a real team. The Spartans were fine against Michigan and Nebraska, but they haven’t exactly been pushed by one of the country’s top teams yet. Now Ohio State comes in on a mission. Everyone keeps waiting for the Buckeyes to look human, but every week they keep surviving and moving on. The Penn State game aside, Wisconsin might end up being the best team Ohio State has to face before playing Florida State. And while the Spartans won’t be bad and the MSU defense will be fine, it’s going to take a tough Buckeye win to keep the amazing run from Meyer rolling. Why You Should Give A Hoot: Stanford slaughtered Arizona State on the Farm on Sept. 21, but that win means as much as if it had occurred two years ago. The Sun Devils are a very different team than they were in the early going of the season, when inconsistency tripped up lofty preseason expectations. Through the first five games, Arizona State had lost twice, and only a gift from the officials in the Wisconsin game saved them from a 2-3 record. But then everything began to click in Arizona, and a rout of Colorado on Oct. 12 ended up lighting the fuse of the Sun Devils’ current seven-game winning streak. Now, No. 11 ASU isn’t just winning games, it’s annihilating opponents in Florida State-like fashion — last Saturday’s 58-21 demolition of rival Arizona was a perfect example. For second-year head coach Todd Graham, the previous couple months could go on to pay dividends for many years in Tempe. In the short term, this Saturday represents a rare opportunity to garner national exposure and a chance to play in the Rose Bowl for the first time since 1996. Although it looked a little precarious for a while, especially after the Nov. 16 loss to USC, Stanford is back in the hunt for back-to-back Pac-12 titles and a fourth straight BCS bowl game bid. The seventh-ranked Cardinal needed help winning the North division, by way of Arizona stunning first place Oregon two weeks ago, but what the program does with that gift this weekend will determine the final grade for the team and David Shaw’s coaching staff this season. Stanford believed it was a national championship contender before the season kicked off. It wasn’t, and a terrible loss to Utah on Oct. 12 made that clear. Still, the Cardinal has defeated five ranked teams, including Oregon when the Ducks were unbeaten and ranked second nationally. A Rose Bowl invitation isn’t a bad consolation prize for a school that’s built a rock-solid foundation, first under Jim Harbaugh and now with Shaw. It’s never easy beating a team twice in the same year, and Arizona State will be out to prove the old adage now that it’s earned a coveted rematch with the defending league champs. Why Stanford Might Win: The Cardinal need Tyler Gaffney to rush for at least 150 yards. The senior has been this season’s Toby Gerhart in Palo Alto, carrying the offense when Hogan struggled. Gaffney might have to be that guy again Saturday at Sun Devil Stadium. He’s been indefatigable with the ball in his hands, toting it as many as 45 times in the upset over Oregon. A productive Gaffney serves a myriad of purposes, from taking heat off Hogan to grinding down the ASU defense in the second half. The 1,493-yard Gaffney is a player Stanford can’t win without this weekend. Why Arizona State Might Win: It’s vital that ASU protects QB Taylor Kelly. When the Sun Devils have languished this season, the O-line was often getting whipped. Stanford, Notre Dame and Utah were able to flush Kelly from the pocket and treat him like a rag doll. Particularly with Marion Grice out, Kelly will need to be given an opportunity to check down his receivers and use an extra split-second to find open windows. The Cardinal defense has the talent and track record to take a game over, so Arizona State will need to opt for the fast-paced brand of football it’s comfortable playing rather than allow the Stanford counterattack to impose its will on the game. What Will Happen: Different team means different result. This is not the September version of Arizona State. The team has vastly improved by executing on offense while making far more big plays on D, and now the Sun Devils are playing at home. Stanford is still Stanford, but twice this season the defending champs have shown vulnerability. And now the Cardinal is catching ASU at a bad time. The Sun Devils will play with the desired speed, urgency and tenacity needed to win a brawl with the Pac-12’s highest ranked team. Meanwhile, Stanford will have an especially tough time containing the ASU defensive pressure, which will put Hogan in situations that lead to costly mistakes. Why You Should Give A Hoot: David (Cutcliffe) vs. Goliath (Florida State). Duke and Florida State have both exceeded preseason expectations, resulting in Saturday night’s improbable meeting in Charlotte for the ACC title. For the Blue Devils, it’s been a storybook season in Durham. Football might still play second fiddle to basketball at Duke, but head coach David Cutcliffe has turned dust into gold in his sixth season at the helm, guiding the Blue Devils from a last place prediction over the summer to the school’s first Coastal Division football crown last week. In what has been a season of milestones for Duke, the program is also bowl-bound in back-to-back years for the first time. Cutcliffe, though, has completely changed the culture on campus, and simply going bowling is no longer the ultimate goal for the Blue Devils. Winners of eight straight games, including victories over Virginia Tech, Miami and North Carolina, they now expect to compete for titles. For Florida State, the Seminoles are back to where they think they belong. Since coach Jimbo Fisher replaced Bobby Bowden in 2010, the program has been building toward this point, where ACC titles are expected and national championships are within reach. Still, Florida State wasn’t even considered the league favorite in the preseason, an honor that belonged to a Clemson team that had lost fewer starters to the NFL. However, FSU dispelled the notion that it would take a backseat to anyone in 2013, wrecking the Tigers 51-14 in a statement game in Death Valley on Oct. 19. The Seminoles have been fueled by a swarming defense and rookie quarterback, Jameis Winston, who is considered a top candidate for the Heisman Trophy. Sliding up to No. 1 in the BCS rankings after Alabama’s loss at Auburn, Florida State is two wins away from its third national championship — and the school’s first since 1999. Standing in its way this week is an upstart team that’s been defying odds and raising the bar for Duke Football since the end of September. Why Duke Might Win: The Blue Devils will need to generate multiple non-offensive touchdowns. Since Duke isn’t equipped to compete with Florida State in a traditional manner by going toe-to-toe with the ‘Noles for 60 minutes, the Blue Devils are going to need unconventional point production from defensive and special teams in order to narrow the talent divide. Jamison Crowder and redshirt freshman DeVon Edwards will play central roles if the Devils are able to stick around in the game. Crowder has taken back two punts for six, while Edwards has scored four times — two on picks and two on kickoffs. Why Florida State Might Win: The Seminoles need to maintain focus. Between the Winston sexual assault investigation and the allure of playing in the national championship game, there has been no shortage of distractions for the Seminoles. If they hope to take down the Blue Devils, FSU is going to need to concentrate on following the formula that’s led to an average margin of victory of 53-11 through 12 games. That game plan will include running their attack and put their superior talent in a position to make plays. If all the pieces fall into place, Fisher ought to be able to empty his bench in the second half. What Will Happen: Duke has done a magnificent job playing Cinderella throughout 2013, but their fairytale ending was last week’s win over North Carolina for the division title. While the Blue Devils possess the confidence and the momentum to beat any good team right now, Florida State is elite and it holds an edge over Duke at every unit of the depth chart. On offense alone, the Seminoles have far too many options and the Duke defense will feel like it’s playing shorthanded at times on Saturday. Meanwhile, Winston will make one final statement for the Heisman voters with another impressive performance. If the game happens to be competitive beyond halftime, mark it as a big surprise. Then immediately hand Cutcliffe whatever coach of the year hardware’s in sight. Why You Should Give A Hoot: If Oklahoma State wins, it takes the Big 12 title and is off to the Fiesta Bowl for the second time in three years. If the Cowboys lose, then the winner of the Texas-Baylor game later in the day will go to Glendale. Since beating OSU 27-0 in 2009, the Oklahoma defense has taken a nap in the Bedlam series, giving up 41 in a win in 2010, getting drilled 44-10 in 2011, and having a rough time in a wild 51-48 victory last year. This season has been odd for the Sooners, who have gone a completely respectable 9-2, but failed miserably in spotlight games, getting blasted by Texas and blown over by Baylor. Even so, with entertaining wins over Notre Dame, Texas Tech and Kansas State already, a victory Saturday over an in-state rival for a ten-win regular season would cap off a successful year. There might not be a BCS game at the end of the rainbow, but the Cotton Bowl or a No. 3 Big 12 bowl slot wouldn’t be a bad way to finish up. Everything is working for Oklahoma State. Unfortunately, stained by the loss to West Virginia in September, the Cowboys don’t have a chance of being among the one-loss teams in the BCS championship debate. But with seven straight wins, they’re back on track. Rested after getting two weeks off to bask in the glory of the win over Baylor, the Cowboys have a shot at closing out a fantastic year with a win over Oklahoma to dive into a BCS bowl. Why Oklahoma Might Win: Ball control, ball control, ball control. Oklahoma has grown into a bit of a big-play team, with the weapons to hit the home run from anywhere on the field, but the Sooners are at their best when they’re controlling the clock and the game by limiting big mistakes and keeping the chains moving. The Sooners lead the Big 12 in time of possession, keeping the ball for over 32 minutes per game, while Oklahoma State is awful at milking the clock (admittedly, partly by style and design) keeping it for an average of just 26:44. Kansas State’s Tyler Lockett aside, the Sooner pass defense has held up well. It doesn’t give up the big plays, and it does a nice job of keeping everything underneath. The defensive front might not be great at generating a pass rush, but it’s good enough to be disruptive and it holds up well against pedestrian running games like the one Oklahoma State trots out. When the offense is converting more than 30 percent of the time on third downs, the Sooners are 7-0 and have won all but the Texas Tech game by double digits. Why Oklahoma State Might Win: So what has been the big difference in the turnaround from a sluggish first half of the year to a dominant second half? The Cowboys have been moving the chains well, doing a terrific job on third downs; one example: they converted over half of their chances against Baylor. On the other side, the defense is getting off the field. They had a few problems on third downs against Texas, but they’ve stuffed just about everyone else. Over the first half of the year, OSU held only two teams – Mississippi State and Lamar, when OSU wasn’t exactly trying – to under 35 percent on third downs. Over the last five weeks, Texas moved the ball, but Baylor’s high-powered O converted 39 percent of the time. Everyone else was under 30. Oklahoma’s offense was terrific against Kansas State, but it has had sluggish moments this year. The O has fallen under the 30 percent third down conversion mark four times this season, two times pairing with losses to Texas (15 percent) and Baylor (23.5 percent); the other two were close calls against West Virginia (29 percent) and TCU (23 percent). What Will Happen: Oklahoma State will keep the momentum going. The Sooners will play well enough to keep pace, but wild shootouts have been the norm over the last few years in the series, and the Cowboys will boast more firepower down the stretch, coming through late in dramatic fashion.